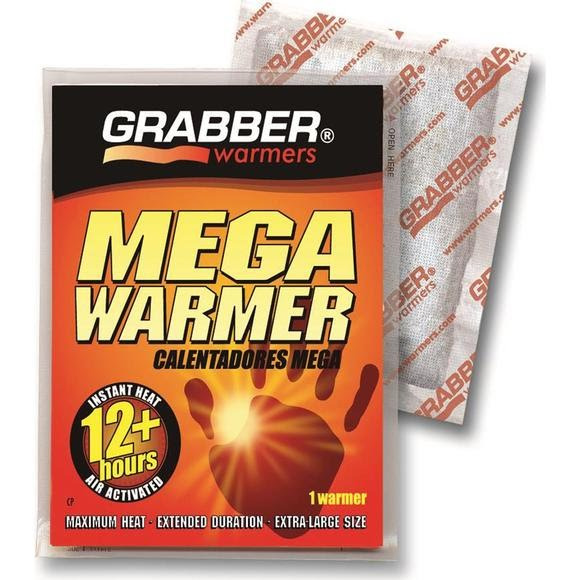 Grabber Mega Warmer is a portable, everyday heat source you can take anywhere! Just open the package and within minutes the Mega Warmer will keep you warm for over 12 hours. It's dry, clean, odorless, non-toxic and non flammable. Great for pockets, in a Grabber Sleeping Bag Pouch, or as refills for any Grabber Cozy Muff or Grabber Stadium Seat. Grabber Mega Warmer is a portable, everyday heat source you can take anywhere! Just open the package and within minutes the Mega Warmer will keep you warm for over 12 hours. It&apos;s dry, clean, odorless, non-toxic and non flammable. Great for pockets, in a Grabber Sleeping Bag Pouch, or as refills for any Grabber Cozy Muff or Grabber Stadium Seat. Warmers are widely used for portable, long-lasting heat therapy. If you suffer from cold, sore feet and toes as a result of Arthritis, Raynaud&apos;s, Lupus, Scleroderma, Sjogren&apos;s, Myalgia or just poor circulation, Grabber provides soothing warmth. What are Warmers and how do they work? The secret is simple: Magic. Okay, not really. People often refer to air activated warmers as chemical warmers, based on the exothermic chemical reaction which creates the heat. We prefer the term elemental warmers, since the ingredients are all elements that occur in nature! No bubbling-flask chemicals here, just elements of the earth like iron, carbon, water and salt. The remaining ingredients are cellulose, commonly found in cotton, and vermiculite, a natural mineral.